Audition process: Please fill out the form below with the day that you are requesting for the audition. Please give us several choices to choose from. The audition process will take about 30 minutes. Please arrive early. For the audition: Please come warmed up. 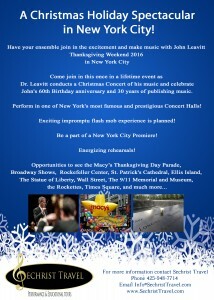 We are asking all participants to prepare a Broadway Show Tune or an Art Song of your choice. Both the accompanist and Dr. Leavitt are excellent sight readers but we would encourage you to select a piece that you can expect the accompaniment to be successful with no rehearsal. Please fill out the form below with the requested information. Do you play a Musical Instrument/What/Proficiency?